Amid parts and pieces of miniature circus wagons and a menagerie of partially completed zebras and giraffes, Bill Mattison sits hunched over his brightly lit workbench in his basement workshop wearing a pair of jeweler’s magnifying glasses. Using an ultra-fine artist’s paint brush, he carefully applies intricate red arrowheads to each of the sixteen spokes that radiate from the hub of a one-and-a-half-inch circus wagon wheel. On a nearby shelf sits a pair of cast iron acrobatic clowns that Mattison’s grandfather gave him for Christmas when he was seven years old. “My clowns needed a place to perform, so I built them a circus,” says Mattison. One thing led to another, and the Mattison Brothers Circus was born over eighty years ago. When Mattison was a boy, the country was just coming out of the Great Depression, and his parents (like many Americans) didn’t have much money to spend on toys let alone expensive circus models. Always resourceful, Mattison used whatever he could find—tin cans, old cardboard, and modeling clay were his construction materials. He had no tools other than the few hand-operated ones his parents had (this was all before the advent of electric tools). So Mattison did his woodwork with old, discarded razor blades with glued-on handles and drilled holes with a hand-turned pin vise with a needle. Much to his family’s dismay, in the midst of his model building activities, thirteen-year-old Bill Mattison ran away from his Madison home in the summer of 1941 and hitchhiked south to Illinois to join the Barnum & Bailey Circus as a workman, or roustabout. This adventure opened another chapter in Mattison’s romance with the circus. His parents called the local sheriff, who found Mattison on the circus lot the next day. But before the sheriff could send him home, the circus commissary head talked to Mattison’s father on the phone and promised he’d get Mattison safely home at the end of the summer. His father was relieved to know that his son was all right and in good hands, and Mattison settled into life with the circus. In those days, the circus traveled by train. Performers rode in comfortable Pullman cars, but roustabouts like Mattison slept in cars with bunks stacked three high and three across. That first night on the rails, Mattison, being the smallest and newest roustabout, had to sleep in the middle bunk. “Beside me was a man who undressed in front of me and then proceeded to take off his wooden leg,” recalls Mattison. “I quickly froze and closed my eyes, scared to move or barely breathe.” The following night, he broke the rules and slept out on the flatcar carrying the tent canvas. The logistics of the circus were complex. Like a city, the circus needed space for everything from wagons to dining tents, dormitories, corrals, a side show, and, of course, the big top. Because the circus lot in every town or city was different, a “twenty-four-hour man” arrived the day before the show to stake out the grounds and make sure that every bit of this fabulous temporary city would fit on the lot. Nothing was left to chance. Local kids were often recruited to hold the “dumb” end of the tape measure, usually in exchange for a free ticket. When Mattison joined the circus, his job as a roustabout was a bit more dangerous than holding a tape measure. An elephant hoisted him up to the twelve-foot-tall sidewalls of the big top. From there, Mattison climbed up the lacings that held the canvas sections of the tent together, tightening them as he went, to the top of the big top, 62 feet above the center ring. Once there, he climbed through a small hole, where he straightened the large bale rings encircling the center poles, and climbed down again. Something new happened every day. Once, in Winona, Minnesota, he noticed that the animals were restless and creating a stir. Mattison looked down and spotted a rattlesnake slithering along the ground. He grabbed a shovel and calmly beheaded the snake. The superintendent was so impressed that he promoted Mattison from the rigging detail to prop boy, a more prestigious (and less dangerous) job than roustabout. But circus life was not for him, and, as promised, Mattison returned to his family in Madison at the end of the summer. When he was about fourteen, he completed his first Mattison Brothers Circus, featuring electrical lighting, music, and moving performers, with over 250 animals, 75 wagons and 15 tents. The name pays homage to the brothers—Charles, John, Albert, and Otto—who founded the Ringling Brothers Circus in 1884 in Baraboo, Wisconsin. By the 1930s, these sons of German immigrants were among the most famous of American entrepreneurs. After his circus outgrew the family’s backyard, Mattison displayed it on the southeast corner of Spaight and Few Street and at Madison East High School, the East Side Festival, and a Milwaukee school. Mattison’s detailed, miniature circus reproduction was even featured in Boys’ Life, Capital Times, and Wisconsin State Journal. Mattison continued making circus models through his high school years, until football and his studies began to take up his leisure time. He started up Star Photo while still in high school and built it into a well-known Madison business. He married, raised a family, and became nationally known for designing and building racing sailboats and especially iceboats; he was one of the nation’s top iceboat competitors. But over the decades Mattison never lost his love of the circus. 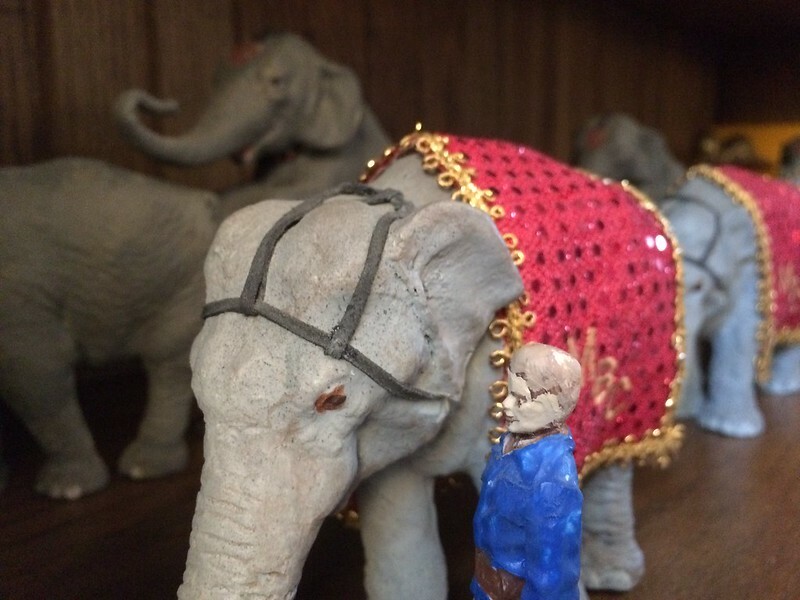 As a frequent participant in Milwaukee’s Great Circus Parade and regular visitor to the famous Circus World Museum in nearby Baraboo, Mattison still felt that same thrill he did when he was boy. He wanted to preserve that experience for his children and grandchildren. 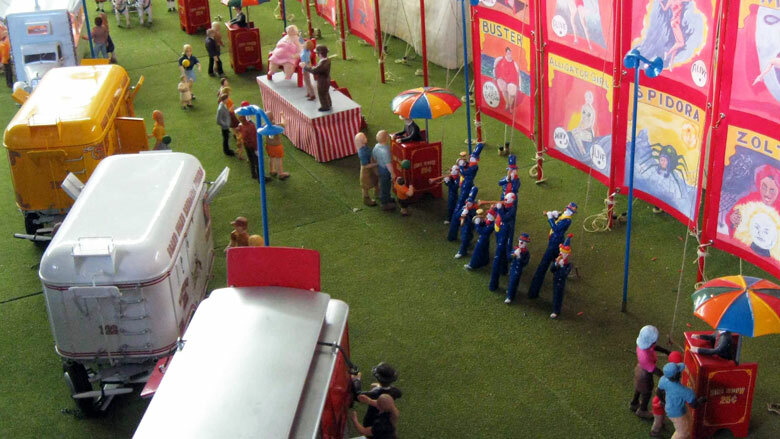 When Mattison retired in 1998, the Mattison Brothers Circus became the vehicle to take him back in time. He says that getting the colors right is one of the most important and hardest aspects of model building. Because most books on the circus were published before the advent of color photography, Mattison looks for the original artists’ renderings. “Circus World Museum now has a great library with the most accurate information in the world about American and world circuses,” he says. Using an elaborate step-and-repeat process, Mattison makes the fixtures, or molds, to make the parts. Consistency is critical, and Mattison works using a rigorous half-inch-to-one-foot scale. His models are built out of basswood because it’s easy to work with and readily available. Brass is his preferred metal for hardware. Mattison measures the length and width of each wagon and cuts the base, which is approximately 3/16-inch thick. Starting with the bottom, he adds the sides, ends, and tops. Finally, the doors go on after the roof is framed. Then he spray-paints them using an airbrush. The wheels come last. All doors, springs, wheels, and hinges open, close, turn, or move in whatever ways the actual circus wagons or vehicles would require. The trap doors and clean-out mechanisms on the cage wagons are built as if to remove waste from tiny, live animals. The pulleys that raise the canvas on the big top, of course, work just like they do in real life. Noting color and detail from historical photographs, Mattison hand-carved the basswood ornamentation for the parade wagons and the Lion and Mirror wagon. His model of Cinderella’s carriage is finished with gold leaf. Her glass slipper rests on a pillow, and the carriage lanterns have working lights. The Golden Age of Chivalry wagon, which carried a beautiful woman atop a two-headed dragon, comes apart, just like the real one, so it’s ready to ride the rails after a parade. Interesting details abound. The ticket taker stands fold up and the umbrellas come off. Inside the ticket wagon, the lights are on and there is even a safe. Smoke wafts from the forges in the blacksmith shop. Occasionally, he will buy commercially manufactured animals—giraffes, lions—if he can to save time and labor. But Mattison casts the horses in latex rubber in various different poses. By breaking apart the neck, head, and legs, and putting them back together differently, he gets even greater varieties of poses from his cast horses. Then he paints them. Each one is correctly harnessed. Even though Mattison says he’s “not much of a musician,” the bells on his bell wagon are all tuned to different notes and they actually play. Like his bell wagon, the calliope on the America wagon plays different notes, but is run by steam. Mattison built a tiny, 100-psi stainless steel boiler and connected it to the brass whistles and valves. Heat from the boiler would have destroyed a wooden wagon, of course. So, true to the original, Mattison’s model is clad with metal and features an open roof and sides that allow the steam to escape. Mattison doesn’t keep track of the time he spends building each piece. “I don’t want to,” he says. But he knows the bell wagon took a year for the bells alone. Cast in the state of Oregon, the bells were tuned by a computer to achieve the right frequencies. Mattison would tap a bell, whose sound registered in a computer that turned a lathe that trimmed the bell’s shape until it produced the right frequency. The bells were then sent to Milwaukee to be cast in wax molds. His wife Mauretta found some small metal type, and a jeweler stamped “Campbell Foundry” on the finished bells, which are stationary but played with a clapper that moves inside. Unsatisfied with the sound the bells produced on their own, Mattison made an amplifier, which he buried in the wagon, to boost their volume. It’s this kind of unyielding commitment to verisimilitude that earned Mattison a place in the Circus Model Builders Association’s Hall of Fame, of which he is one of the first lifelong members (number 208). The award reflects a belief that his wife Mauretta has held for years: “There’s sawdust in his veins,” she says. Mattison traces his obsession for detail and passion for the circus to his childhood. It’s during this time that Mattison discovered—and cultivated—his talent to make and fix almost anything. When Mattison constructed a full circus wagon weighing over a hundred pounds (before his parents even owned a car), he tackled the project like a geometry problem. When he was in tenth grade at Madison East High School, Mattison used a complex sand casting process to make an aluminum elephant from a five-piece mold, which was years ahead of what he was being taught. “My art teacher, Mr. Dhein, didn’t believe I did it. So I made fifty and put them on his desk,” recalls Mattison. Today, at age 89, Mattison shares his talent and enthusiasm with children who are building models of all kinds. He wishes he could be more optimistic about the future of circus model building but notes that the inspiration—big top circuses and circus parades—are less common now. “It will be a lost art,” he says. “There have been so many changes in the circus that it’s difficult for young people to carry on the tradition. Kids haven’t seen a tent circus, and they won’t be able to see circus animals. The elephants are gone."